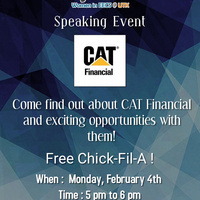 CAT Financial is coming to the Min H. Kao Building on Monday, February 4th from 5:00 to 6:00 pm! The event will take place in Min Kao Room 405. Come learn more about CAT Financial and the exciting opportunities they have for us in EECS. Free Chick-fil-A!